Kristin’s Clothes Line and the Pink Moose sounds like the title of an imaginative story for children. However, it’s really two stories of two resourceful young women in Severance, Colorado, whose businesses provide children and families with exceptional items made from upcycled materials. 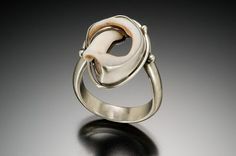 I met Kristin McMahan at The French Nest Market in Fort Collins this past summer. 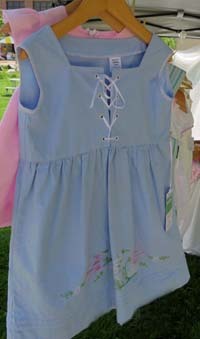 Handmade dresses for little girls hung from clothes lines strung around her booth. Embroidered flowers and birds adorned their skirts, which were frequently edged with crocheted scallops. 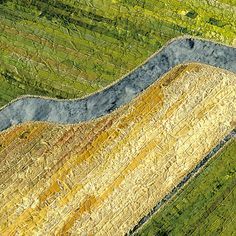 Occasionally a small embroidered apron had been sewn into a dress’s waistline. The dresses epitomized the sweetness of little girls, so I couldn’t help stopping to admire them and to chat with Kristin. She explained that the unique feminine touches that I found so irresistible were the result of upcycling pillowcases from decades ago, when decorations on the wide hems of pillowcases were the norm. 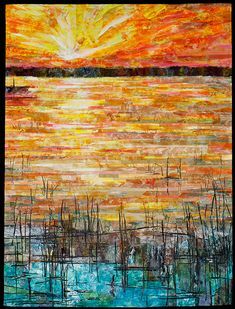 I remembered embroidering the hems of a few myself and marveled at how she had transformed similar items. The little aprons that hung from some of the waistlines were the ends of old-fashioned dresser scarves, she went on to explain. Linens for Kristin’s Clothes Line come from antique stores and E-Bay — and from customers looking to preserve family treasures. One pillowcase provides enough fabric to make an entire dress from newborn size up to size 8. Kristin purchases fabric to coordinate with the dresser scarves that she envisions as little aprons. Her dress patterns come from major pattern companies, but the dresses themselves are one of a kind. 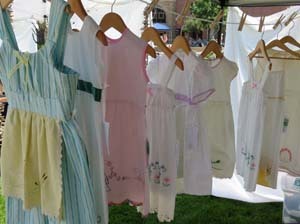 Recently she extended her business to include ladies’ aprons, also made of upcycled heirlooms; they sold out right away. While I was taking the pictures you see here, I overheard an older woman talking to Kristin. Light gray hair waved softly around her face, and she had a gentle manner about her. 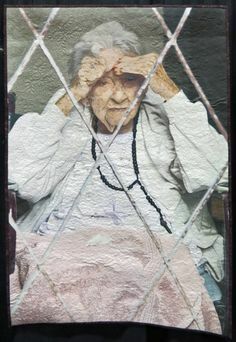 She was telling Kristin she had stacks of her family’s vintage pillow cases that she couldn’t bear to toss out. Kristin assured her that she could use them for her dresses, and I saw the look of relief on the older woman’s face. I don’t know what their agreement was, but I do know this: I couldn’t imagine a better end for a pillowcase. Meanwhile, farther down the line of tents at The French Nest, Jennifer Kalous was adjusting wreaths and other craft items around her booth. Assorted crafts were the focus of her business when she launched The Pink Moose at the beginning of this year. By June, two types of wooden items that she had introduced later on a whim were rapidly becoming top sellers of The Pink Moose. One such item – an old-fashioned dining chair – brought me to a sudden halt when I arrived at her booth. Jennifer had painted the back and legs a cheery green. A simple flower design, which she had artfully executed with ebony stain, filled the natural wood seat. The chair was stunning. 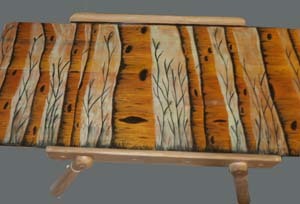 Aspen forests often decorate the tops of furniture upcycled by Jennifer Kalous. Upcycling is a passion with Jennifer, who has a Master’s degree in environmental education. She and her husband Cody look for interesting pieces of old furniture anywhere they can find them, but particularly on Craig’s List and in thrift stores. Her approach to upcycling furniture is much the same, no matter what the piece. She paints the support structure with Annie Sloane Chalk Paint. At $40 per quart, it’s an expensive choice, but it sticks to everything, Jennifer told me. She doesn’t try to sand out nicks or other imperfections but let’s the past add to the furniture’s character. 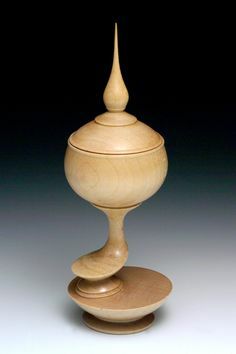 It’s quite the opposite for the surface she will paint with stain; there Jennifer carefully sands to bare wood. 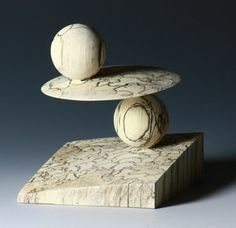 She pencil sketches her design onto the wood and then uses a brush to outline the edges of her drawing. With a rag she spreads the stain as needed to create shading. When the completed design is dry, she applies three to four coats of marine varnish to protect the surface from spills. 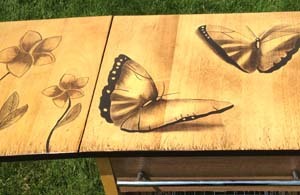 Aspen trees, butterflies, and flowers are among her favorite subjects to add to upcycled furniture. One of the pieces awaiting her attention in her workshop is a child’s desk. I would love to see what design Jennifer creates to delight its next young owner. Perhaps it will be something like the top of the workstation pictured above. Around the time Jennifer launched The Pink Moose, she and Cody needed to block the stairway of their home to protect their baby girl from falls. 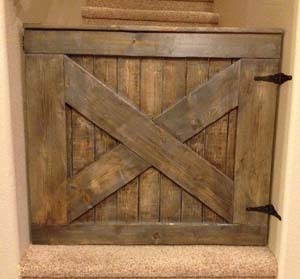 To have something that would be attractive and a pleasure to use, Cody made two gates from used wood and Jennie finished them to mimic the appearance of barn wood. I had the opportunity to try their gates myself recently. Quality hinges let the gates swing effortlessly and silently, and the hefty latches slide as easily as skis through powder snow. A notch at the corner of one gate allows it to clear the railing and to fill the stair opening perfectly. When Jennifer opened a shop for the Pink Moose on Etsy, she included a picture of the gate for fun, just to see what would happen. Since April, The Pink Moose has sold more than 50 gates for homes from California to Massachusetts. Not all of the gates look like the one at the Kalous’s home though. Some customers have wanted a less rustic look, so Cody has left off the wooden X through the middle and Jennifer has finished the gate with white paint or a stain of the customer’s choosing. Some customers have had unique functional design needs and Cody has accommodated those too. Whatever customers want in baby gates — or other small wooden items, for that matter — Jennifer and Cody go to great lengths to provide. Kristin expects to be back at the French Nest Market in May. In the meantime, her dresses for little girls are for sale at KristinsClothesLine on Etsy. You can also e-mail her with special requests at KristinsClothesLine@hotmail.com. Jennifer will be setting up a booth for The Pink Moose at The French Nest again on October 18. If you have to miss it, check out her shop for The Pink Moose on Etsy. You won’t find upcycled furniture there, however; Jennifer actively posts on the Facebook page of The Pink Moose to share the latest furniture makeovers and custom items. Message her on Facebook if you have a special request, or e-mail her at thepinkmoose@yahoo.com. 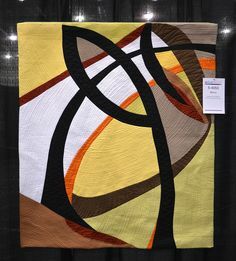 This entry was posted in Fabric & Fiber, Wood and tagged baby gates, children, dresses, furniture, Jennifer Kalous, Kristin McMahan, pillowcases, upcycle on October 8, 2014 by Sally. Those little girl dresses are darling. What a wonderful way to preserve something from a grandmother’s home. I’m glad you agree, Kathy. They would make wonderful gifts especially using family linen. Thanks for making that possibility clear to readers.